The charming village of Port Navas comprises a handful of stone cottages at the head of the creek, beside its very own village hall and yacht club with restaurant. Once home to the Duchy Oyster Farm, a historic stone quay sits opposite the house and plays host to the annual Port Navas Regatta. In the 1800's granite was exported from here for London's Tower Bridge. The nearby villages of Constantine and Mawnan Smith provide a good range of shops and amenities, including the Constantine Stores wine merchants, whilst the university town of Falmouth with its beaches, yacht marinas, Maritime Museum and Royal Cornwall Yacht Club is also close at hand. Port Navas Creek itself is a tributary of the beautiful Helford River estuary, immortalised by Daphne Du Maurier in her novel Frenchman's Creek.. The river has a number of deep-water moorings, and is home to the Helford River Sailing Club and Helford River Childrens Sailing Trust. There are two local waterside pubs; the thatched Shipwrights pub on the south side of the river and the Ferry Boat Inn on the north side. 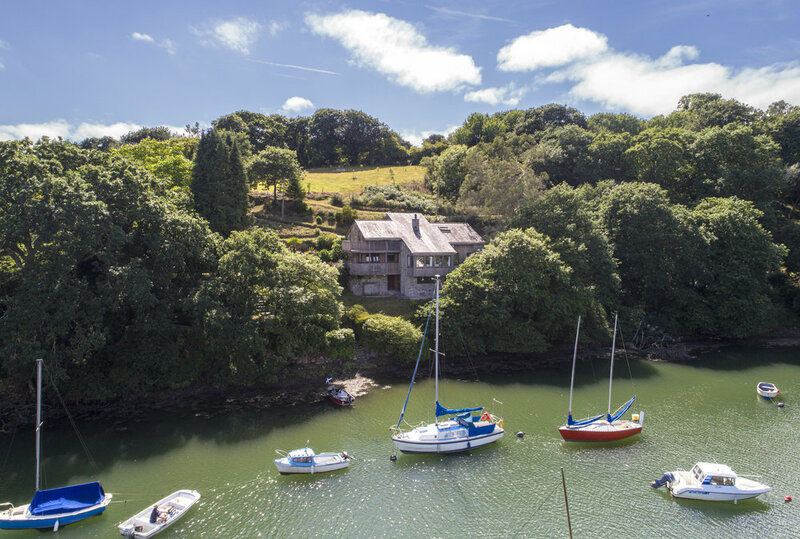 Much of the countryside surrounding the Helford Estuary is owned by the National Trust and is designated as an Area of Outstanding Natural Beauty, flush with an endless number of creek-side and coastal walks that are within easy reach. Road links to south Cornwall have much improved in recent years and the A30 dual carriageway just to the north of Truro connects to the M5 motorway at Exeter. Truro has a railway station on the London to Penzance mainline with overnight sleeper service. Newquay Airport provides daily flights to London Gatwick. MAIN HOUSE With an extraordinary position on the banks of the creek, this four-bedroom detached house sits in approximately two acres of gardens and grounds with beautiful views of the water. This distinctive cedar-clad and stone house was designed by renowned local architect Roger Hocking RIBA in 1985. Approached over the shared private lane to the Calamansack Estate, the house is well-settled in its environment and orientated to maximise the views of the creek and quay. Double-height ceilings create a fantastic sense of drama inside, whilst wrap-around balconies and connected patio areas capture the enchanting landscape. 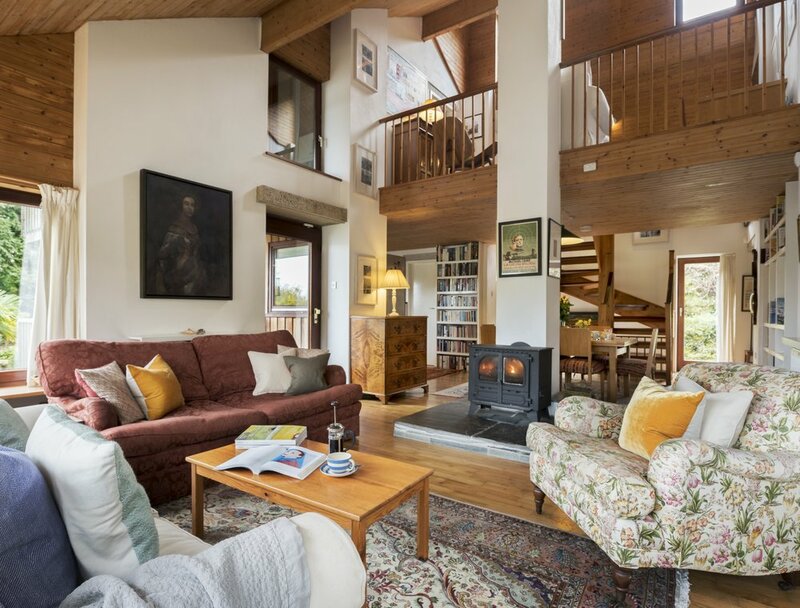 Accommodation is divided over three levels, with entrance at ground floor to a wonderfully proportioned L-shaped living room containing the reception, kitchen and dining space. Long stretches of timber-framed windows ensure engaging views. The modern, open-plan living area centres around a towering chimney stack, fitted with a wood-burning stove, that sends heat through the core of the house. A large double bedroom is also found on this level with en suite bathroom. The top floor has two good-sized bedrooms, both equipped with en-suite bathrooms and private decked balconies. On the creekside, the chalet roof overhangs a section of the top-floor balcony to provide some shelter from the weather, creating a versatile outdoor space. The lower-ground floor houses a large fourth bedroom (currently arranged as a games room), with adjoining utility room, that could perhaps be converted in to an additional bathroom if desired, subject to any necessary consents. 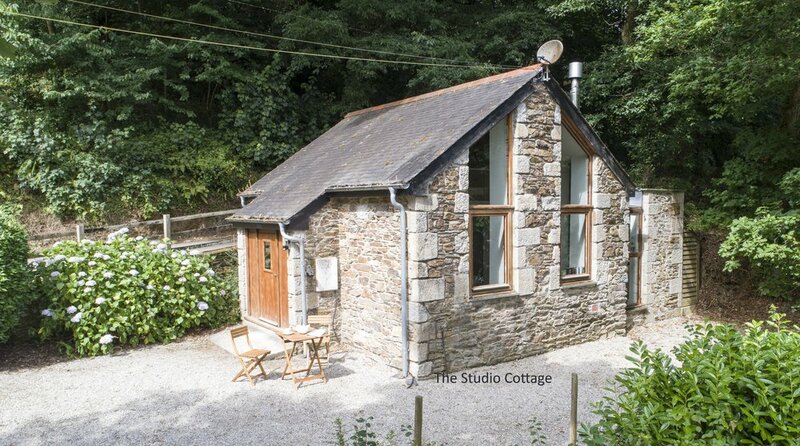 STUDIO COTTAGE Approximately 200 yards from the house, towards the western boundary, there is a wonderful detached studio cottage equipped with a bedroom, shower room, living room and kitchen. Once an artist's studio, it has its own private garden, separate gated vehicular entrance and private parking area. From the private access lane (shared with The Duchy and Calamansack), there is a private driveway down to the garage. The grounds surrounding the house are made up of a series of terraces and lawns cut into the slope, in all around 0.7 acre. Across the private access lane and above the house there is a small sloping field and woodland of approximately 1.5 acres, with delightful views over Port Navas creek. Dinyan has long frontage to the creek with two outhaul moorings (on licence), and the freehold extends to the mean high water mark. A set of stone steps lead from the garden down to the creek. Mains water and electricity. Private drainage. LPG gas. DIRECTIONS Approaching Port Navas from the Constantien direction, as you arrive at the centre of the village, with the creek and village hall ahead of you, turn right up a steep drive. Follow this private lane for about 200 yards and Dinyan & The Studio will be found above the creek on the left hand side. All content © copyright Jonathan Cunliffe Ltd 2018. All rights reserved. Jonathan Cunliffe Ltd registered in England & Wales 11099919.